Someone asks me a question like this at least once a week. So what’s my answer? I’ll tell you. Video marketing is the most potent marketing tool available to us in this day and age. And, it’s not hard to do. So, if you aren’t going video marketing gung-ho, give us a call and we can help you get started with producing some great content. What type of videos should I be producing? There are five types of video that any business should shoot as part of their video marketing schedule. As content consumers, we can’t get enough of how to videos. That’s no surprise! How to videos are highly practical, provide social currency and, by nature, give us solutions to real everyday problems. You can make How To videos about almost everything imaginable. …Just from watching YouTube videos! That’s the power of How to videos. There are still plenty of niches in every industry in need of useful How-To videos, including yours. These are videos that answer common questions that 80 percent of your customers ask. A vet may get the same question about post-operation care for dogs. A cleaning product may have many people worried about what to do if a child drinks their product. In both cases, you could quickly and easily make a short video providing an answer to these questions. Firstly, they help the sales process. Think about it, whenever talking to a prospect you can guide them to your video library where they can find answers to pre-purchase questions. That way you don’t have to answer all their questions over and over again on the sales call. Instead, you can get down to business and talk about what’s important. Another reason FAQs are useful is because they encourage post-purchase customer satisfaction. There are often many questions that pop up in a client’s mind after they hand out their credit card info. Especially after purchasing premium-priced services. By offering FAQ videos, you can ensure that your client is happy and feels that they are being provided with premium value and well taken care of. The next type of videos you should be producing are product and service videos. Every single landing page on your site should have one. Words they have seen over and over again on a million sites and more. 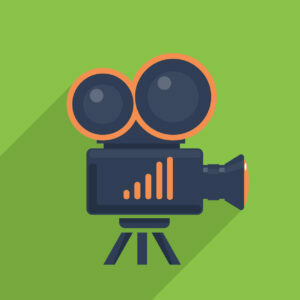 When you have a 1-minute product explainer video, they’re going to stay on your site to watch it, while they would give your competition’s wordy site no more than a 5-second scan. All of a sudden you’ve 10Xed the length of time people are staying on your landing page just because you have a video. This additional time on your site also helps your ranking on Google, in turn drawing more visitors to your products. I’m not talking about making a commercial. It’s just a video where you describe the product or service and its benefits. Nobody wants to see a commercial. If you do decide to make a product or service video, remember to BAP. 1. Who we are & What we do. 2. What the product does. 3. The info you need to know. 5. The resolution you’re going to get from it. That’s it. No fluff. No scene with a mother and a child in a kitchen. Just authentic and practical information about your product or service. This is a great kind of video. It shows a prospect whether you are a good fit for them and answers the question “is this what I’m looking for?” quickly. This is one of the best videos you could do for your business. Here’s is who we are, and here’s what we do. Here’s the ideal customer for this product. This kind of video doesn’t need to be more than just a few minutes long, yet it will help you avoid wasting tons of time with people who aren’t right for your business. Ps. A “Who we are” video is great for the homepage. The last type of video you should be producing for your business is an email signature video. Most of us send about 40-50 emails a day. Right? And when you have a team of 10 people in your business, that’s already 500 daily emails. Why not take advantage of the 500 sets of eyeballs already looking at your email signature by adding a video link? Sure, I could say more. But it’s ok to have just a quick video to introduce yourself. Alternatively, if you don’t want to use a Bio video, you could share a link to your latest video marketing content. This is what I do. Whenever I create a new video, I ask all my staff to add a link to it in their corporate signature. Those are the five types of videos that every business should product. Remember! Be Authentic and Practice.